Smile Perfection from Your Cosmetic Dentist in Washington DC! Have you been experiencing regret about not addressing the imperfections in your smile years ago? As a result, are you lacking confidence? Your cosmetic dentist in Washington DC says there’s no need to continue lamenting over missed opportunities and wishing that you could turn back the hands of time because you can experience smile perfection right now with porcelain veneers. As you continue reading, learn what the process of getting veneers entails and how these simple applications can leave you feeling like a brand-new person! 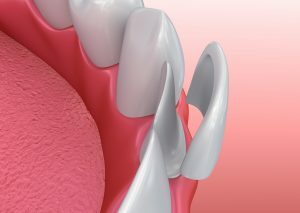 Porcelain veneers are thin shells custom-crafted from high-grade ceramic that mask slightly gapped, crooked, misaligned, crowded or stained teeth. Your dentist will first shave away a thin layer of enamel (the outer layer of your teeth) so that your new applications will fit properly. She will then take bite impressions and capture 3D images of your teeth to be sent to a trusted lab so that your permanent veneers can be crafted. In the interim, you’ll be fitted with temporary veneers, and once the permanent fixtures are available, you’ll return to your dentist’s office to have them placed. You’ll leave with a brand-new, perfect smile! Once you have the smile of your dreams, wouldn’t you like to maintain it? Remember, your teeth aren’t tools. Using them to open bottles and packages is a recipe for disaster and could lead to damaging your veneers or even a dental emergency by breaking or dislodging your natural teeth. Your porcelain veneers in Washington DC aren’t subject to tooth decay, but your natural teeth underneath still are. Thus, be sure to practice excellent oral hygiene as you normally would to prevent bacteria growth. You may wonder, “Can veneers stain?” They are highly resistant, but your other teeth aren’t, so it’s best to limit your consumption of foods and beverages that lead to stains and discoloration. Otherwise, you’ll have a major a contrast in your smile – white veneers and glaringly different looking natural teeth. A final way to ensure the longevity of your veneers is to visit your dentist at least twice a year for cleanings and checkups. While you’re there, she’ll be able to assess the condition of your veneers, and if there are any problems, she can provide you with some options to rectify them. There’s no need to hide any more and feel ashamed of the minor flaws in your smile. With the easy, minimally invasive porcelain veneer process, you’ll leave your dentist’s office a brand-new person. To experience smile perfection, reach out to your local professional today! A graduate of the New York University College of Dentistry, Dr. Yelena Obholz is just as passionate today about helping patients as she was when she first obtained her degree. She continues to expand her knowledge through hours of continuing education annually, which helps her deliver the best care to her patients at Aesthetic & Family Dentistry. Dr. Obholz can be reached for more information through her website. Comments Off on Smile Perfection from Your Cosmetic Dentist in Washington DC!